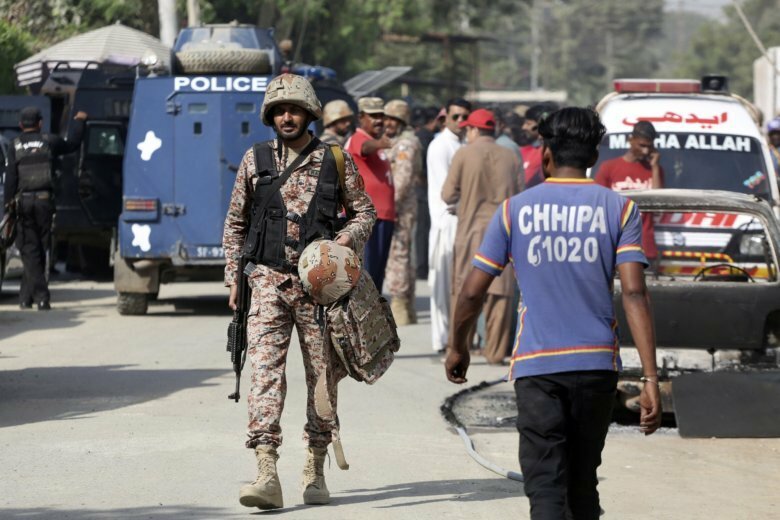 KARACHI, Pakistan (AP) — Armed separatists stormed the Chinese Consulate in Pakistan’s southern port city of Karachi on Friday, triggering an intense hour-long shootout during which two Pakistani civilians, two police officers and all three assailants were killed, including one who was wearing a suicide vest, Pakistani officials said. In Beijing, Foreign Ministry spokesman Geng Shuang said China would not waver in its latest big project in Pakistan — the China-Pakistan Economic Corridor — and expressed confidence that Pakistan could ensure safety. Still, China asked Pakistan to beef up security at the mission. Pakistan’s Foreign Minister Shah Mahmood Qureshi spoke to his Chinese counterpart Wang Yi by phone and assured him that a “thorough investigation will be carried out to apprehend the perpetrators their financiers, planners and facilitators” linked to the attack on consulate, according to a foreign ministry statement. It quoted Yi as saying that the attack was an attempt to impact Pakistan China relations and to harm the two countries’ economic pact. Still, the attack will compel China to step-up security in Pakistan and increase cooperation with local authorities, said Zhao Gancheng of the Shanghai Institute of Foreign Studies. Associated Press writers Munir Ahmed and Kathy Gannon in Islamabad, Riaz Khan in Peshawar, Pakistan; Christopher Bodeen in Beijing and Ashok Sharma in New Delhi contributed to this report.